I found myself with a dozen limes this week. 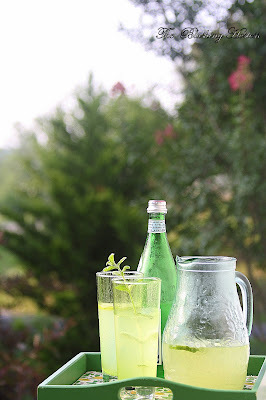 When I worked in Mexico, I was addicted to lime agua fresca. I have recreated something like it here. It was perfect to have in the fridge coming in from hours in the garden. Not to mention, easy on the eyes. I grow several mint hybrids, among them pineapple mint, which I have used here. I also love this mint in a light vinegar sauce over grilled lamb, for muddling in mojito's, and for it's multi-color talent in garnishing desserts; worth planting if you can find it. Make simple sugar syrup: Heat the sugar and water over medium heat in a small saucepan only until the sugar is dissolved completely. While the sugar is dissolving, use a juicer to extract the juice from 4 to 6 limes, enough for one cup of juice. Add the juice and the sugar water to a pitcher. Refrigerate 30 to 40 minutes. Fill the glass with one third lime-ade mixture, top with sparkling water. Serve with or without ice, sliced limes, and mint. We need to do some "drinking" you and I!